T-Mobile-Sprint merger: Will US regulators allow it? Sprint and T-Mobile want to get married, but to gain the approval of US antitrust regulators, they'll have to make a pretty compelling case. By buying Sprint, T-Mobile would be taking a major competitor out of the market, giving customers who want nationwide cellular service just two other options: Verizon and AT&T. Each would control roughly a third of the wireless market. That is bound to set off warning bells in Washington. It's way too early to determine whether regulators will approve the deal. The Justice Department and FCC declined to comment. But the current regulatory climate isn't exactly anything goes. The Justice Department objected to another telecommunications mega-merger last year when it sued to block AT&T from buying CNN's parent company, Time Warner. The companies are fighting the lawsuit in federal court, and the closing arguments take place Monday. Both the FCC and the Justice Department blocked AT&T from buying T-Mobile in 2011. And T-Mobile dropped an earlier bid to buy Sprint in 2014 in part because President Barack Obama's antitrust regulators would have recommended blocking the deal, according to Reuters. T-Mobile and Sprint are a distant No. 3 and No. 4 in the wireless market. Although T-Mobile has made headway with its "Uncarrier" marketing campaign, which did away with two-year contracts, it has mostly stolen market share from Sprint instead of its larger rivals. Sprint is a deeply troubled company buried in debt and unable to consistently turn a profit. As AT&T and Verizon plan to roll out next-generation super-fast 5G networks to their customers over the next couple years, T-Mobile and Sprint are far behind in their 5G efforts. The companies were way late to 4G earlier this decade, and they lost customers to the big guys. The business case for a merger is strong: The companies may need to merge to continue to grow. But survival itself may not be enough to win over regulators. For example, when Staples tried to merge with Office Depot in 2015, the companies said the deal was necessary to stay alive. Amazon was (and is) killing their businesses. But the Justice Department was unimpressed and blocked the deal because it deemed it would harm competition. AT&T and Time Warner also claimed that they needed to merge to stand a chance against Netflix, Amazon and other streaming video companies that are luring customers away. But the Justice Department's antitrust division hasn't been persuaded by these so-called defensive arguments, according to Tim Wu, a professor of antitrust law at Columbia Law School. Regulators have been reviewing cases on the merits of the deals themselves and whether they think mergers will harm competition. That's why the Sprint and T-Mobile merger will "trigger serious scrutiny" from the FCC and Justice Department, said Sam Miller, a professor at UC-Hastings College of the Law and the prosecutor who led the government's first antitrust case against Microsoft two decades ago. When industries consolidate from four to three players, prices almost always go up — not down — for consumers. T-Mobile CEO John Legere and Sprint CEO Marcelo Claure told CNN's Richard Quest on Monday that the deal won't harm consumers because T-Mobile has a reputation for offering low-cost plans. T-Mobile singlehandedly drove the entire industry away from customer-unfriendly two-year contracts. Sprint has drastically cut prices, forcing bigger players to promote "buy one get one" deals. But if T-Mobile eats Sprint and grows to the size of AT&T (T) and Verizon (VZ), the incentive to keep prices down could lessen. The companies claim — as merging businesses always do — that the efficiencies gained by combining infrastructure will help them lower prices for customers. 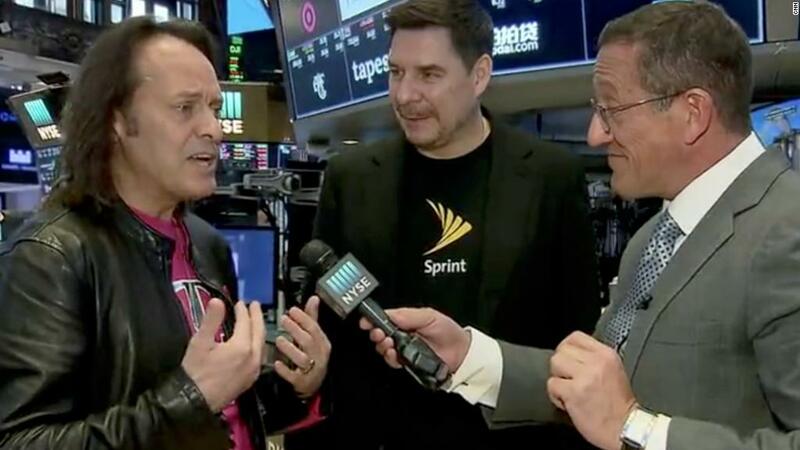 Sprint (S) and T-Mobile expect to save $6 billion a year by combining forces. For example, they'll shut down 35,000 redundant cell sites, which will drastically cut maintenance costs. The companies say they would hire 80,000 full-time employees in the United States once the deal closes, and T-Mobile is also promising a nationwide 5G buildout once the merger is done. Building out a 5G network is incredibly expensive, so combining the two companies should make the process more efficient and cost-effective. "To get this through, T-Mobile and Sprint must present a compelling case that they need to merge to make the technological leap to 5G and that this would benefit consumers," Miller said. That exact argument didn't go over so well in 2011, when AT&T said it couldn't possibly build out a nationwide 4G network unless it bought T-Mobile. The government didn't allow the deal to go through — and AT&T announced its 4G rollout a year later anyway. T-Mobile (TMUS) says it's confident regulators will approve the merger. "We're confident that, once regulators see the compelling benefits, they'll agree this is the right move at the right time for consumers and the country," said Legere on Sunday. Yet the companies decided not to include a breakup fee in case the deal is scuttled. That isn't exactly an overwhelming sign of confidence that the merger will pass regulatory muster. T-Mobile doesn't want to risk handing billions of dollars to its closest competitor if the deal is blocked. "They need to be prepared to fight this in court," Miller said.